Toby Price has described the feeling of his fractured wrist as “on fire” having pushed himself to a slender overall lead with two days of the 2019 Dakar Rally to go. Price predicted a tough event after completing the first of 10 stages, having broken his right scaphoid in a training crash in December. While he missed out on what would have been a first stage win of the current campaign despite getting as far as 3:30s ahead of the field, Price now sits 63 seconds clear of Pablo Quintanilla at the top of the general classification. 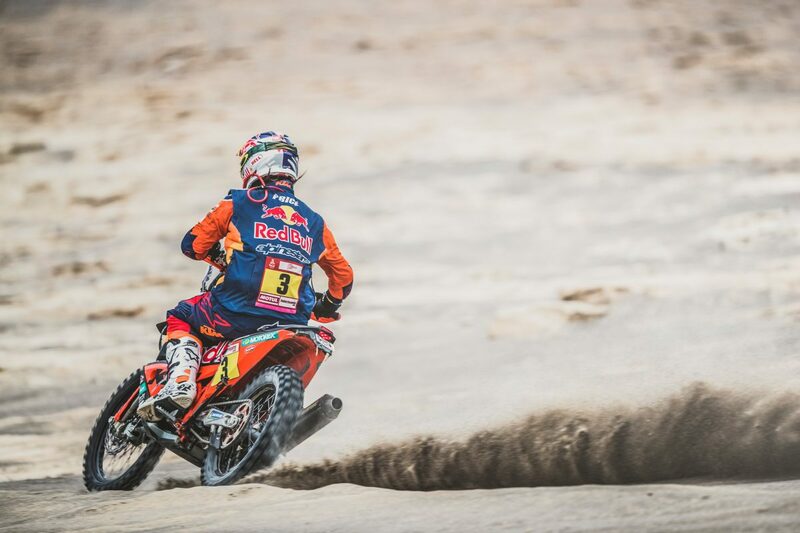 The KTM rider now has to grit his teeth in search of a second Dakar title. “Today, I knew it had to count,” said Price according to Dakar’s official website. “That was my maximum today, so any more than that, well… I can’t do any more. “My wrist is on fire now, so it’s been a long stage, 360 km, but we’ve made it here to the finish and there’s just two more to go – this is a good thing. “You’ve just got to somehow shut it (the wrist) off. The Australian rookies, Ben Young (KTM) and James Ferguson (KTM), are also still going and have improved to 55th and 70th respectively. There have so far been another nine withdrawals from the Bikes on Stage 8, leaving no more than 84 competitors left in the field. John Maragozidis (Yamaha) dropped one position to 14th of the 15 remaining in the Quads classification. CLICK HERE for Stage 8 full report. CLICK HERE for Stage 8 Bikes report.